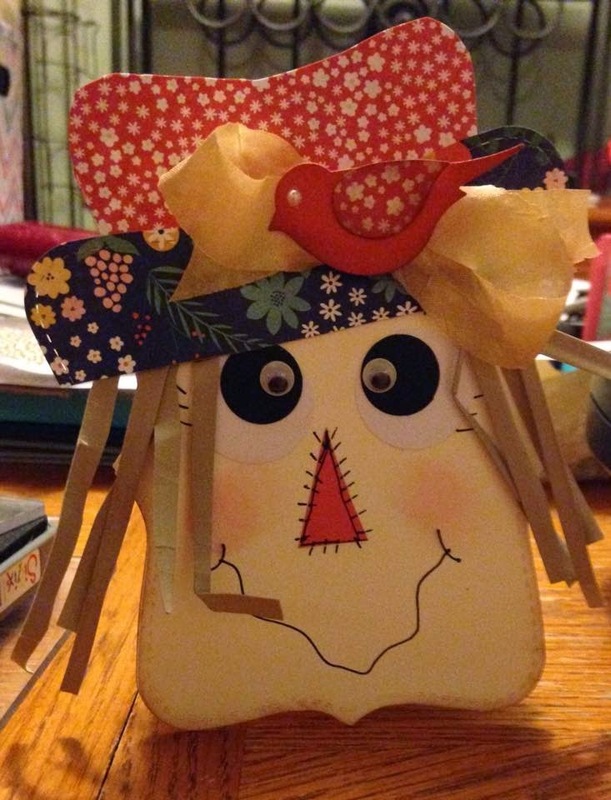 I had seen a Scarecrow Punch Art card on Pinterest and tried to recreate it using the Top Note Bigz Die from Sizzix/Stampin' Up!. I cut the card base from the top note die with a folded piece of vanilla cardstock with the fold just below the top so that the folded portion doesn't cut. I then cut a second flat vanilla cardstock piece with the top note to make my face and glue to the top of the card base. For the scarecrow's face I began by drawing in the mouth with a Basic Black Stampin' Write Marker. Then I cut a little triangle for the nose and drew in the stitching. The eyes were punched out of 1" whisper white cardstock and 5/8" black cardstock and a basic little googly eye was glued onto the black. I also drew in the eye lashes. The hat is cut from the top note die as well. The top part is long side up with the point cut off and with it indented downwards. The bottom of the hat is a piece of coordinating DSP that has been cut with the top note die in a horizontal position. Since I didn't have raffia, I just cut thin strips of crumb cake cardstock that I used for the hair. I glued that on the under side of the hat before attaching and then bent the strips with a bone folder. I glue dotted a bow on the hat. Punched a bird out of coordinating cardstock and punched the wing out of the same DSP that I used for the top of the hat. Sponged the edges with brown ink and sponged the scarecrow's cheeks with a little pink ink. I really like the way he turned out and I'm sure our granddaughter's will too!